The Mineral Activator offers an EPA-approved formula of minerals that will kill bacteria and neutralize your pool water, keeping the pH balance safe for swimmers. The Mineral Activator is a crucial part of the Aqua Smarte Plus System (read below for a full description) for maintaining swimming pool water and fits neatly into the Aqua Smarte Plus Docking Station. The Docking Station automatically controls the flow of pool water to the other parts of the Aqua Smarte Plus System such as the Aqua Smarte Plus Mineral Activator and the Aqua Smarte Plus MizerMax Pac. One Mineral Activator will last for six months or a full season, depending on which comes first. The Mineral Activator holds an formula of minerals that's been approved by EPA. 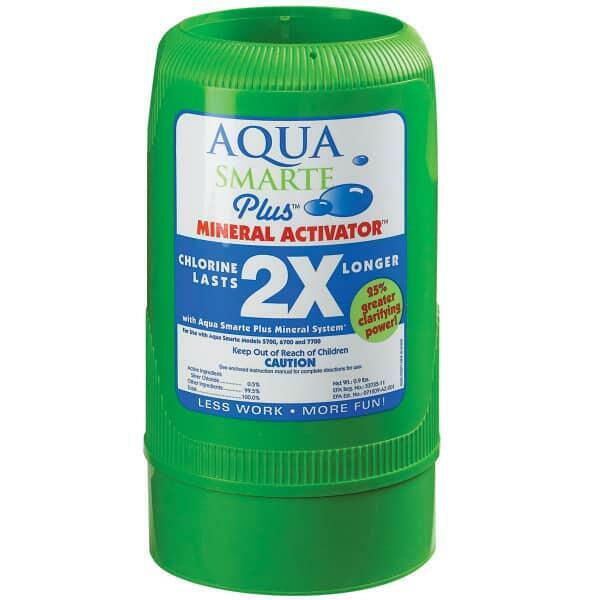 When used properly this activator will kill bacteria and balance the pool water's pH levels. Use this item in conjunction with the Aqua Smarte Plus MizerMax Pac and Docking Station.